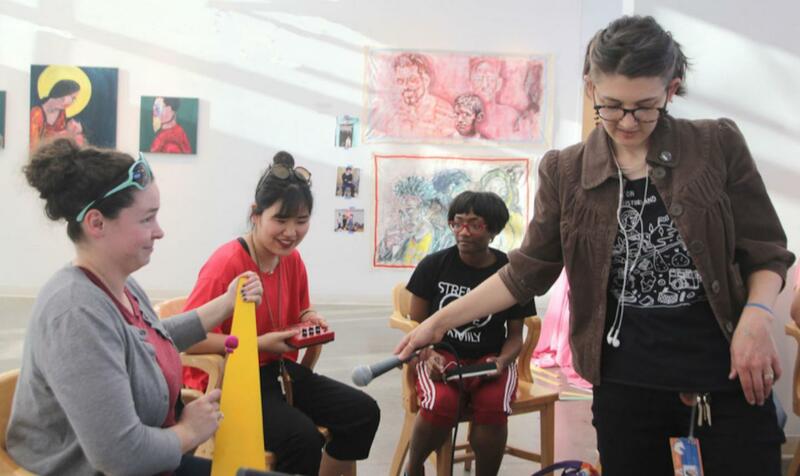 Billi London-Gray, a 2018 graduate of UTA's Master of Fine Arts Intermedia Studio program and a lecturer in the Department of Art and Art History, has won a Puffin Foundation grant for her ongoing project, The Loop and Saw Choir. Her project consists of workshops, jam sessions and performances in which she collaborates with volunteers of all ages and abilities to make music and sound art using musical saws, analog synthesizers, human voice, homemade instruments and looping devices. She now has inducted five groups of volunteers into the choir through separate sound-making events. London-Gray purchased permanent equipment with the grant money. London-Gray shares a bit about the history of musical saws, analog synthesizers and looping in the workshops. She then demonstrates the instruments. "Using unexpected instruments is a strategy to place the workshops at the intersection of art and play," she said. According to London-Gray, the ultimate purpose of The Loop and Saw Choir is to break down right versus-wrong expectations through the use of little-known instruments and improvisation. As art, the project exemplifies a process of exploration and an attitude of curiosity, creating a situation in which the artist both models these aspects and learns them from the participants. Darryl Lauster, professor of Art and Art History, said, "Billi's prolific achievements in the professional field have always begun with a constant level of engagement with and dedication to her community at a grassroots level." London-Gray's work epitomizes the Department of Art and Art History's mission of providing the intellectual, technical and instructional resources to support the development of professional artists who view art making as a process of inquiry and self-discovery. On July 24, following receipt of the award, London-Gray convened The Loop and Saw Choir with children at a day camp in her hometown, Wylie, Texas. Her work aligns with the Puffin Foundation's mission to support artists and art initiatives that seek to transform American society toward a more progressive democracy with greater appreciation of shared humanity. Visit http://www.billilondongray.com/lsc for more information about The Loop and Saw Choir. Visit http://www.puffinfoundation.org for more information about the Puffin Foundation. The foundation awards projects that educate the public on topical issues. The Foundation also gives special consideration to communities and school districts that are underserved by the arts. Additionally, the Foundation focuses on new and emerging artists.